Even though I'm not your first owner, you still accepted me into your heart. Through thick and thin, better or worse, sickness and health, you never let me down. Thanks for the love, joy, happiness you shared with us. We will miss you so much. For me, you're the best of the best friends I have. Lucky we are, having you as part of the family. 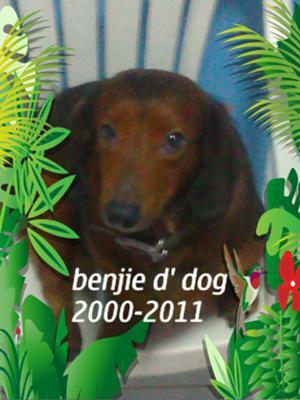 We love you so so much Benjie. I know when time comes, we will be together again, riding my scooter.